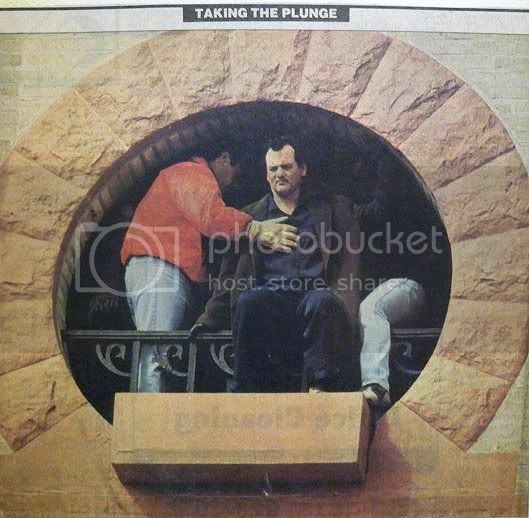 During the spring of 1992, I had the unique opportunity to witness the making of a movie. 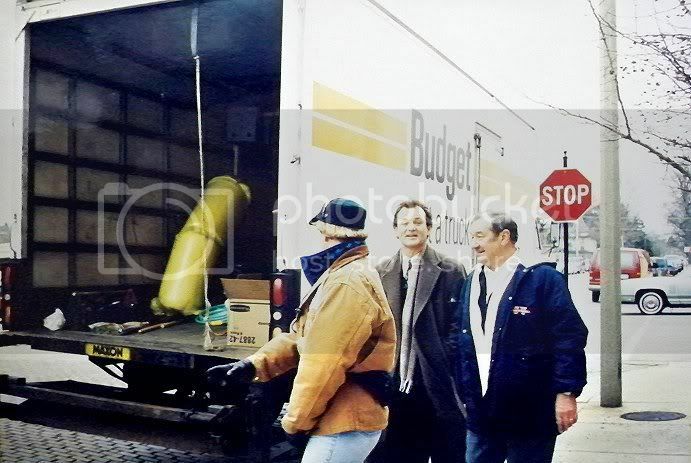 In late 1991, we learned that Woodstock, Illinois was one of several locations being considered for the filming of a new comedy starring Bill Murray. 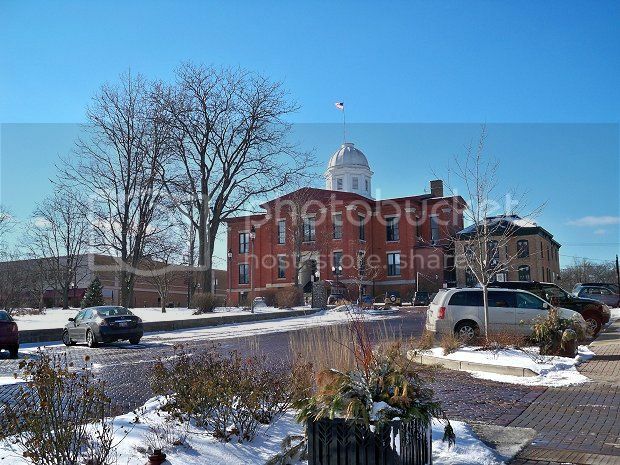 Woodstock's beautiful town square quickly propelled the city to the top of the short list. All that remained was for city officials to agree to the filming. 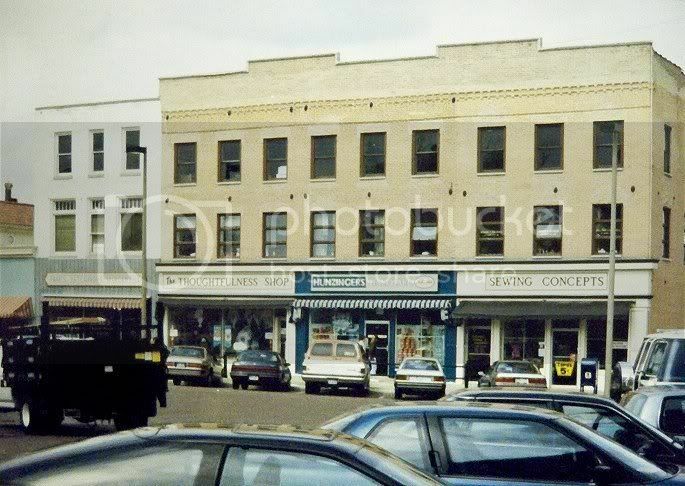 Executives from Columbia Pictures met with area merchants, and they came to an agreement regarding issues such as customer parking and compensation for lost business on filming days. 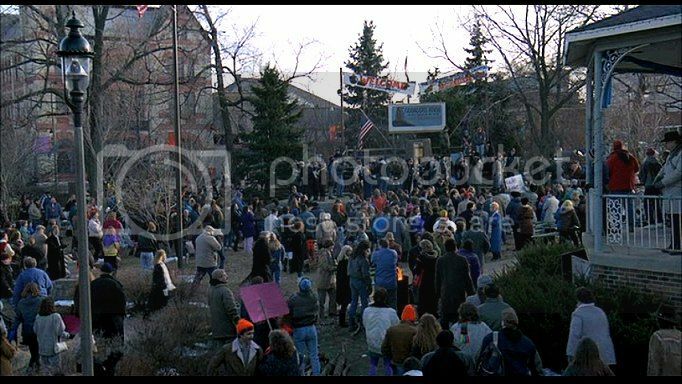 In January 1992, the decision was final: Groundhog Day would be filmed in Woodstock! 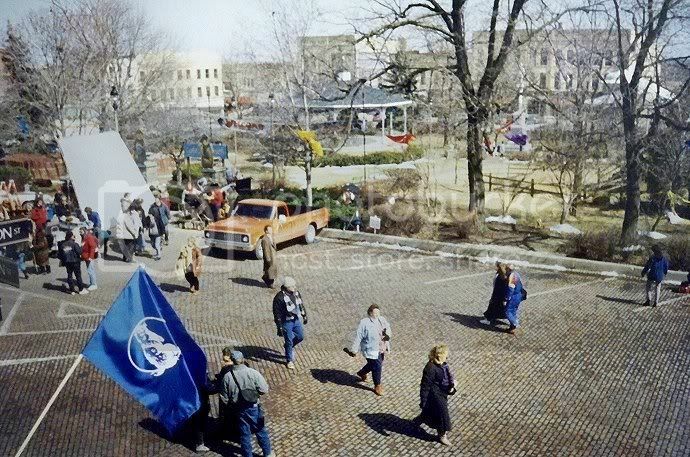 The majority of filming would take place on the square itself. 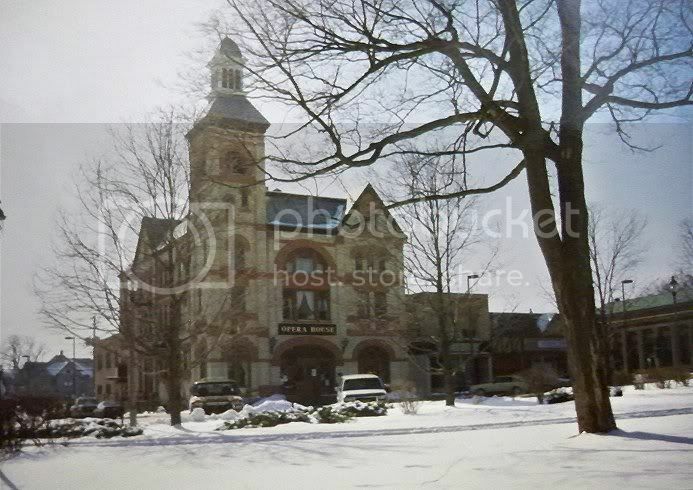 Although I lived in a neighboring town at the time, I worked in Woodstock. 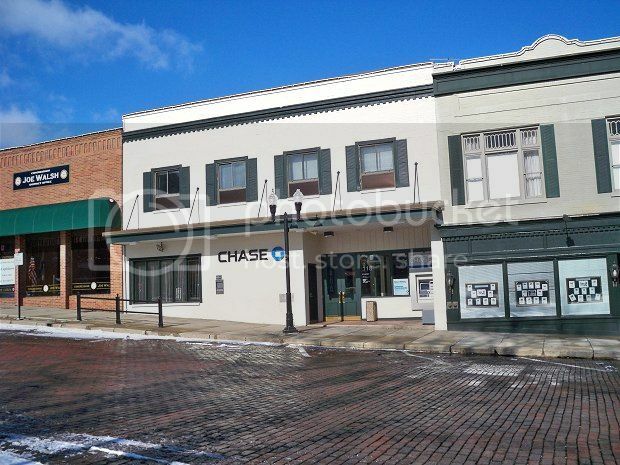 Our building was just one block off the square, putting me in the middle of the excitement every day! 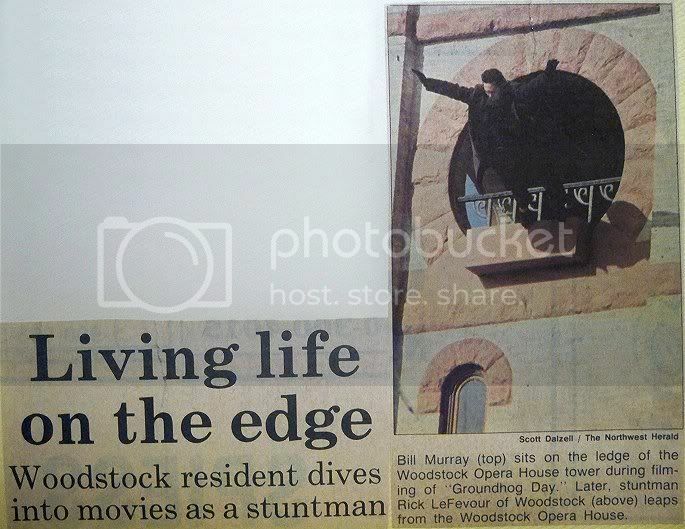 I have lived in Woodstock since 1994. 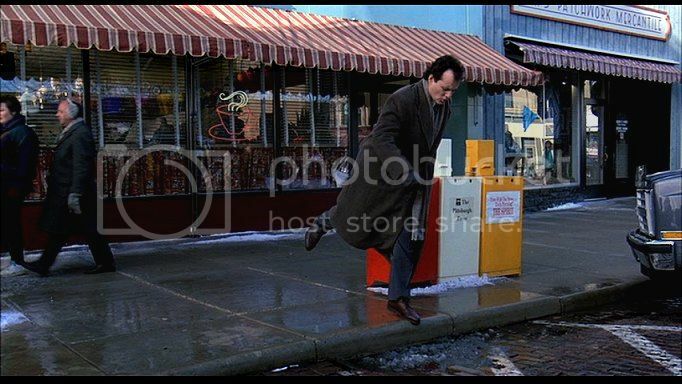 To me, Groundhog Day was the most exciting thing to ever happen here. 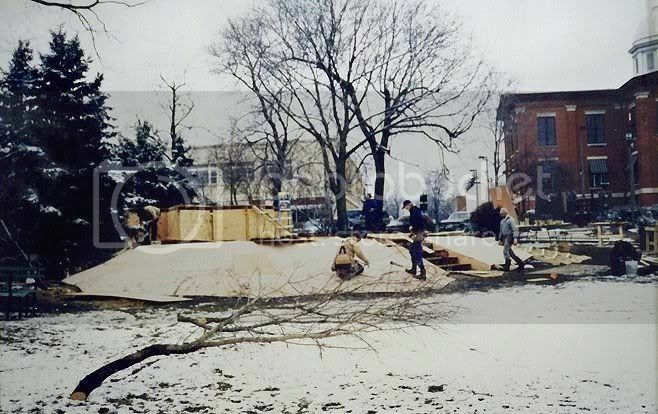 In February 1992, construction of Gobblers Knob began in the center of the Woodstock Square. 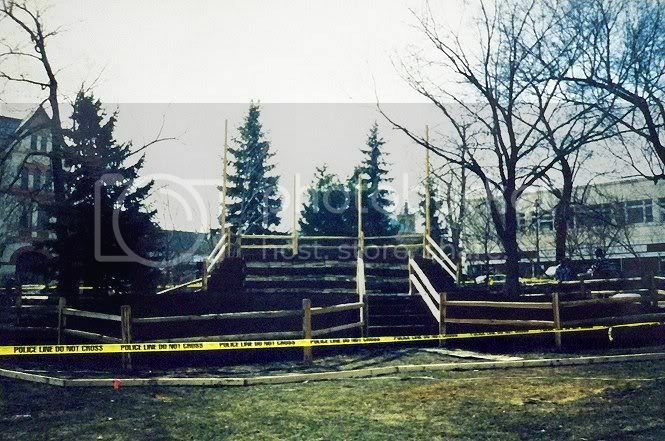 This is where the groundhog ceremony takes place each year. 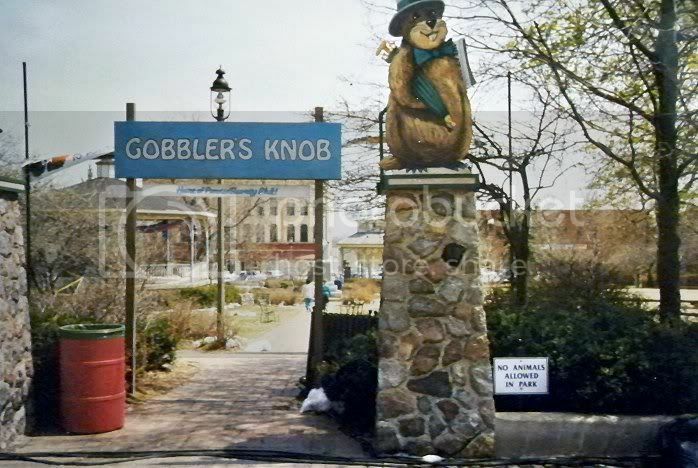 In Punxsutawney, Pennsylvania (the site of the real ceremony), Gobblers Knob is located in a rural area outside of town. In all other ways, the Woodstock version was identical. 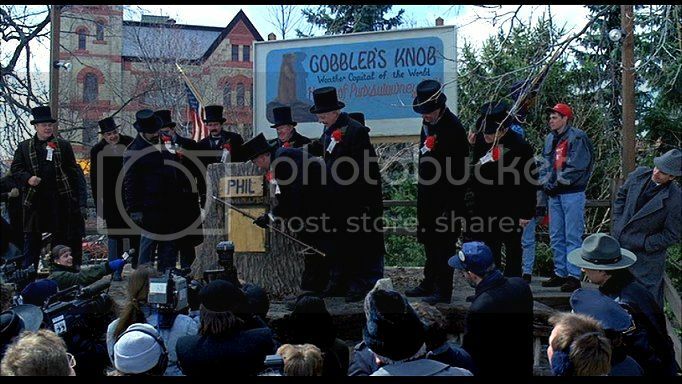 Officials from Punxsutawney were on hand to make sure that Gobblers Knob and the portrayal of the ceremony were faithful to the real thing. 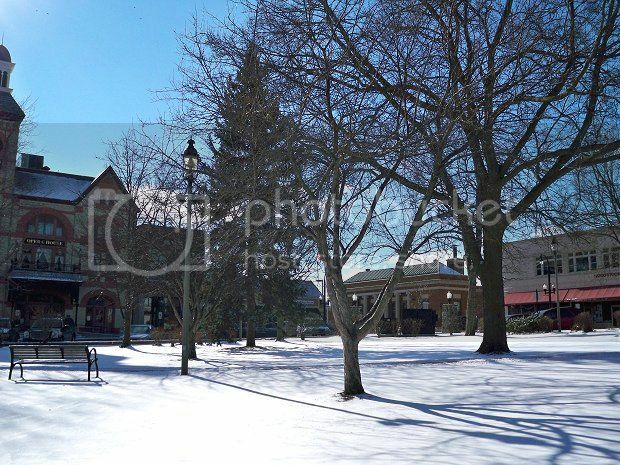 Woodstock is known for its quaint Victorian town square. 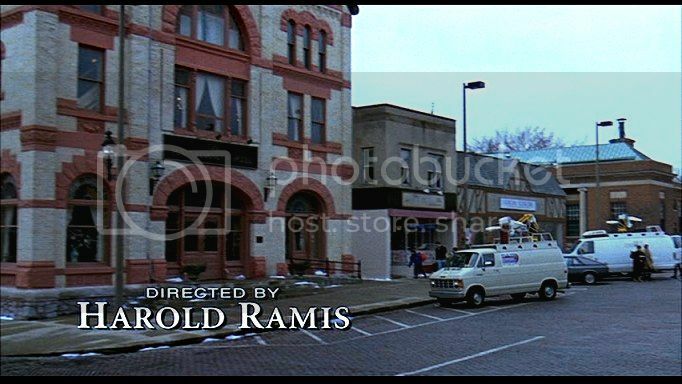 Harold Ramis visited several towns in southern Wisconsin and northern Illinois, looking for a town square just like this one. When he drove into town on that December night in 1991, he knew he had found the perfect place. 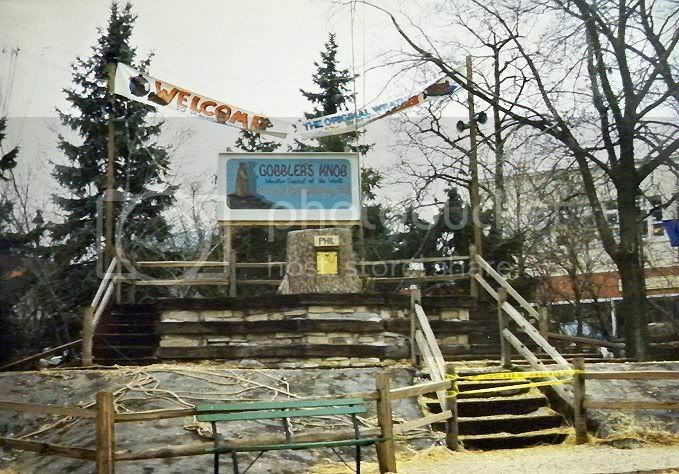 In addition to Gobblers Knob, the square was adorned with banners, signs, groundhog cutouts, groundhog wastebaskets, "Borough of Punxsutawney" traffic barricades, a groundhog statue and boxes selling Pennsylvania newspapers. 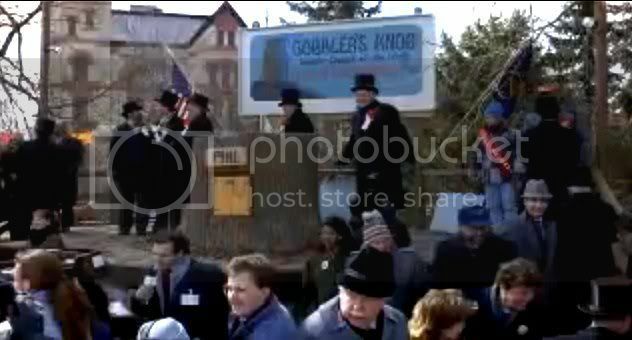 In Groundhog Day, the town itself plays a major role in the film. 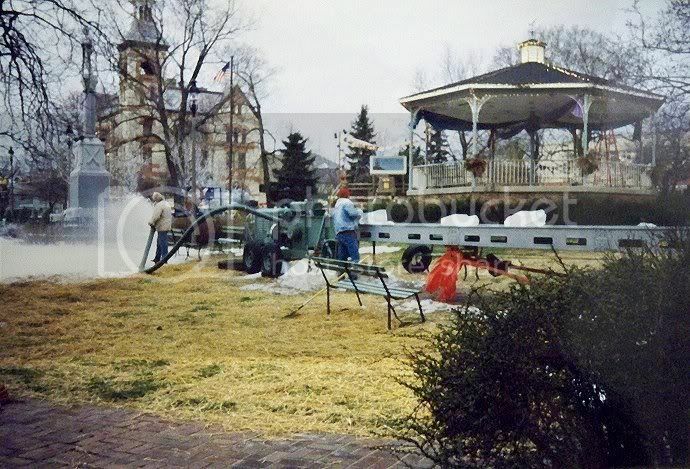 When the entire town square is a movie set, you can't just tear it down or close it at the end of the day. 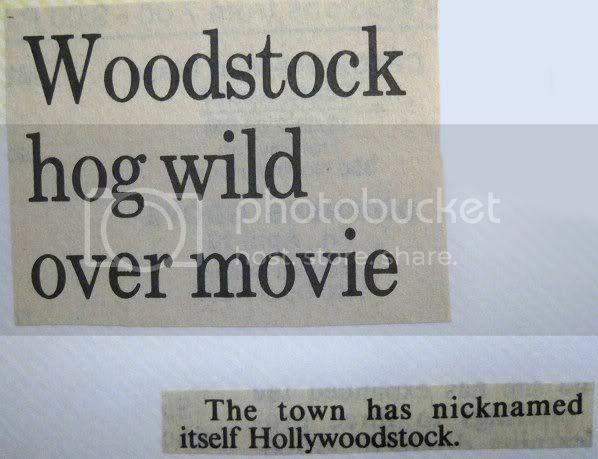 Woodstock had to remain "in costume" for the duration of filming. 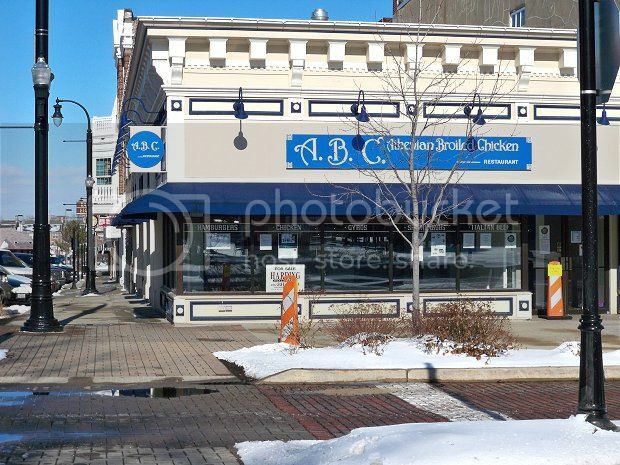 Many businesses on the square were given new names, new signs and sometimes even entire new storefronts. 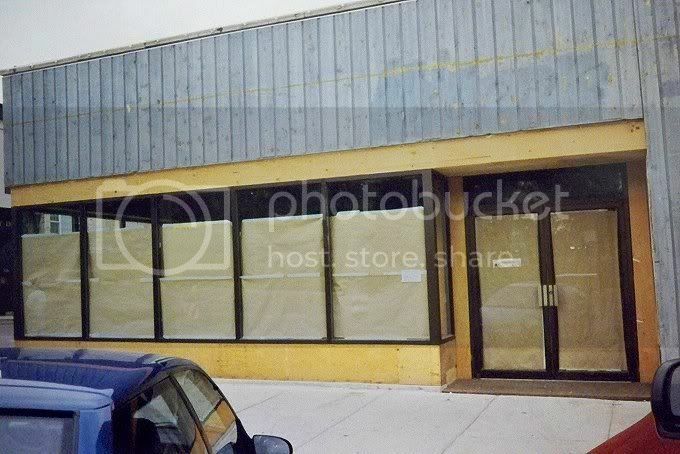 When there wasn't any filming going on, these businesses placed signs in the window reminding shoppers that they were still open. 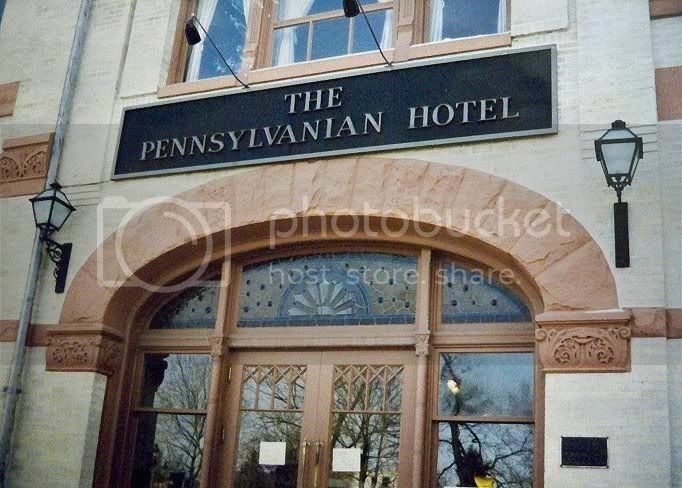 The famous Woodstock Opera House was transformed into the Pennsylvanian Hotel. 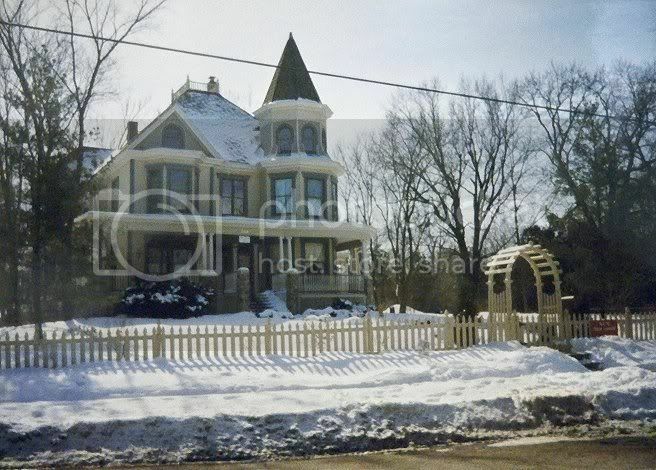 In the movie, this is where Rita (Andie MacDowell) and Larry (Chris Elliott) stay while they're in town. 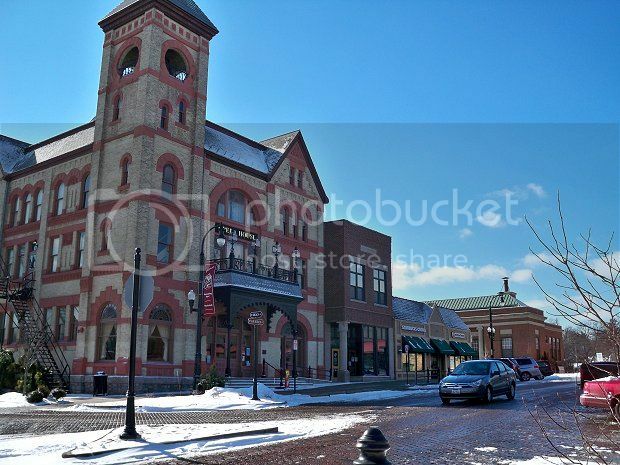 The Opera House was built in the 1890s and hosts many concerts and community theater productions. 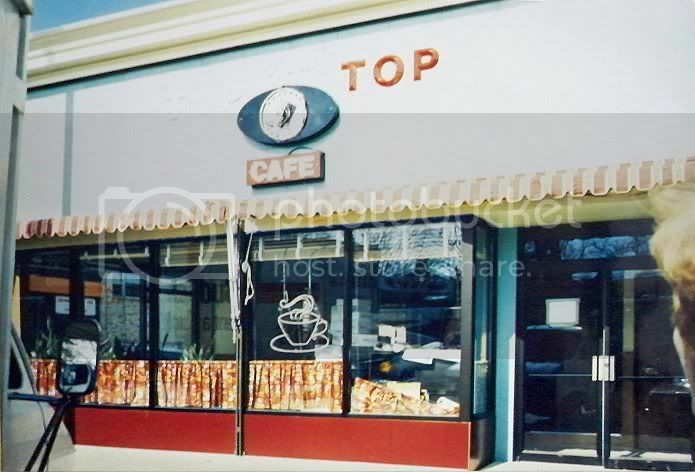 An empty store on the square was transformed into the Tip Top Cafe. 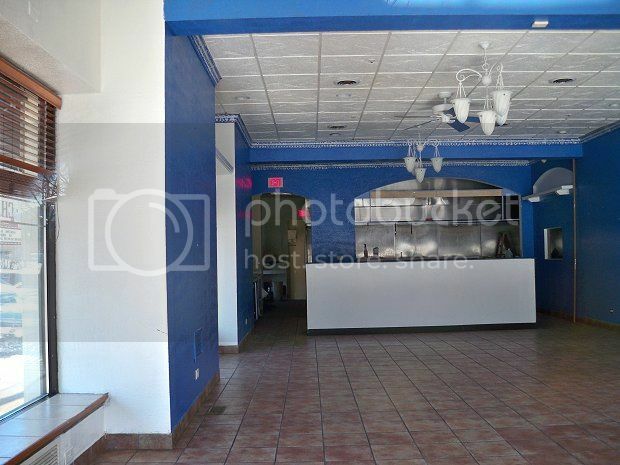 This building didn't just get a new front....an entire diner was constructed inside for extensive indoor filming. 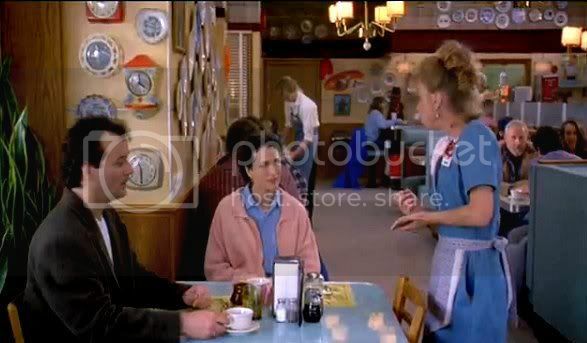 Many scenes in the movie took place in the Cafe. 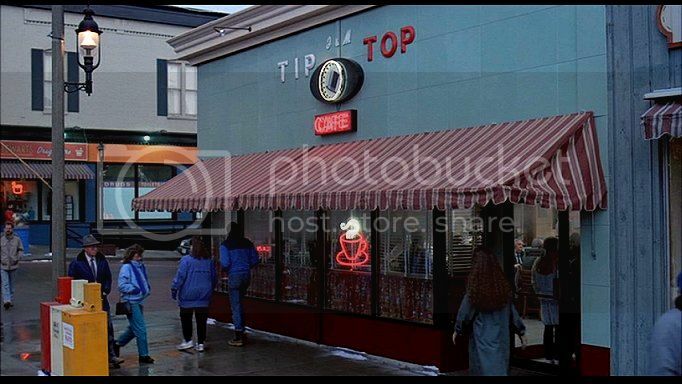 In the 20 years since the movie was filmed, this building has hosted several restaurants, two of which were called the Tip Top Cafe and the Tip Top Bistro. 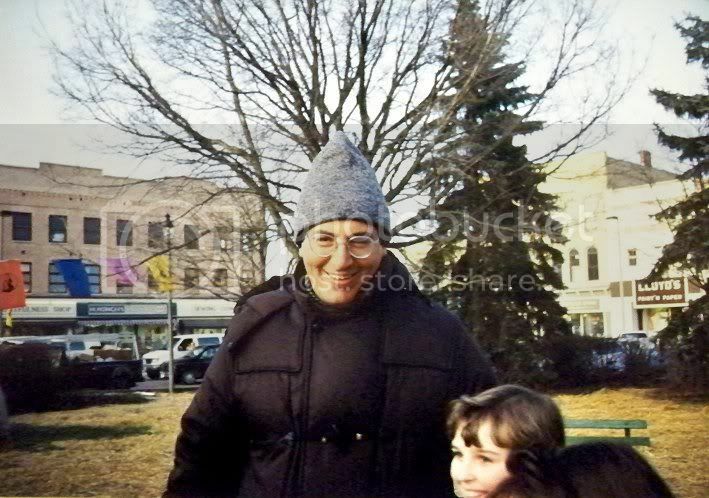 Before filming began, I remember thinking, "Gee, I hope I get to see someone famous! It would be a shame to be this close to the action and not get a glimpse of a celebrity." I needn't have worried! 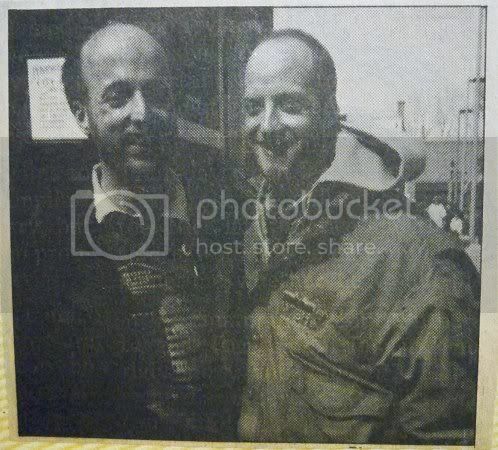 I saw Bill Murray, Chris Elliott and Harold Ramis several times, and I got Chris Elliott's and Harold Ramis' autographs. 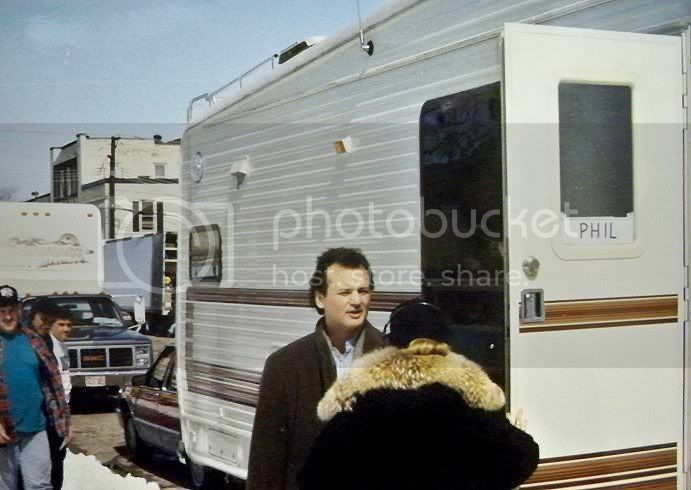 I remember coming out of a store and running right into Bill Murray, with his fans swarming around him and trailing him like he was the Pied Piper. Unfortunately, I didn't see Andie MacDowell at all. 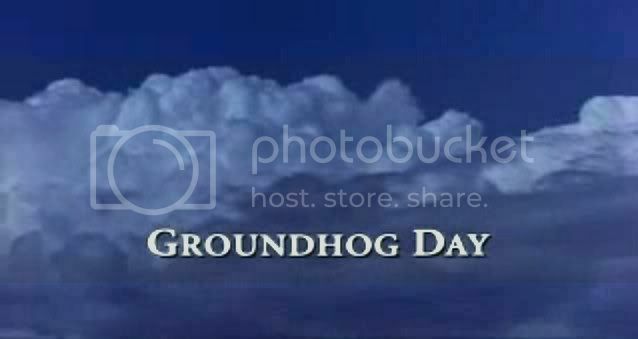 Groundhog Day was the most exciting thing to happen around here in years! 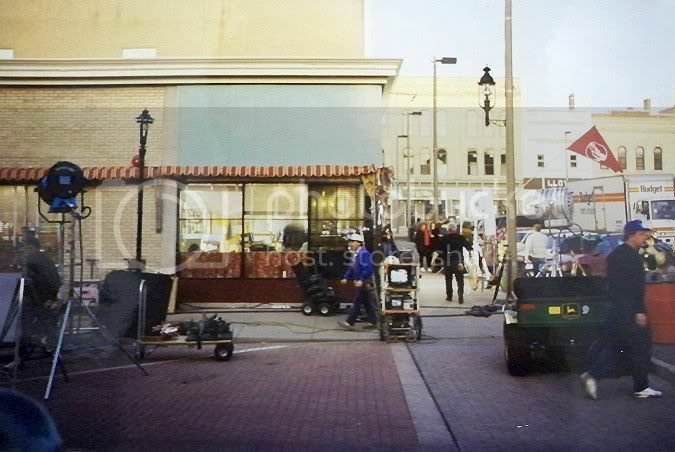 During filming, the town adopted the nickname "Hollywoodstock" and promoted itself as a tourist destination. You could plan your trip by calling the Groundhog Hotline for filming information on the day you planned to visit. 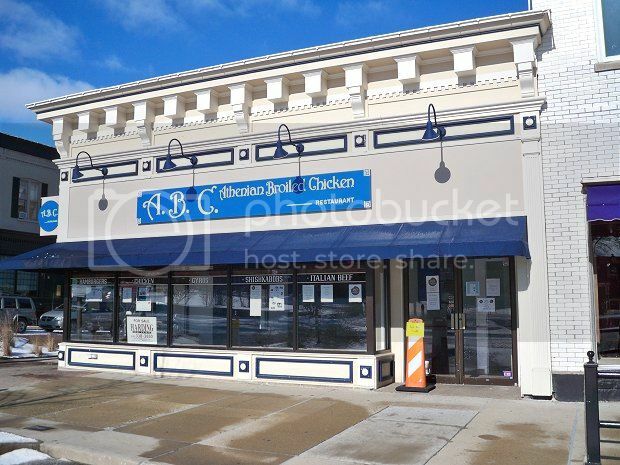 To make things easier, you could park in the Alco parking lot on the outskirts of town and take a free shuttle bus to the square. 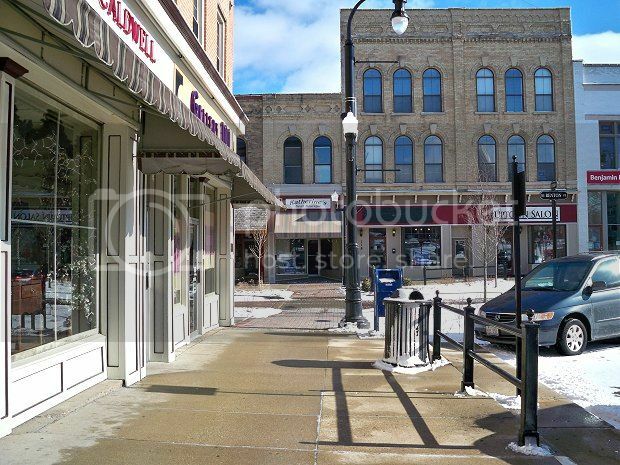 Everything paid off, and locals remarked that they hadn't seen the square so busy in decades. 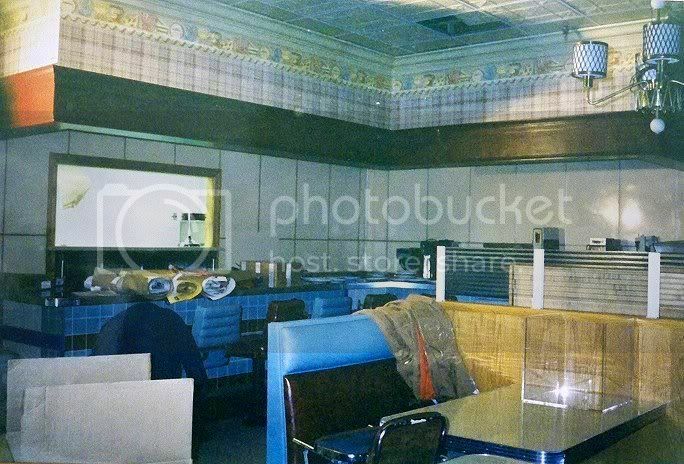 It was almost like the old days, before malls and chain stores took the shoppers away. 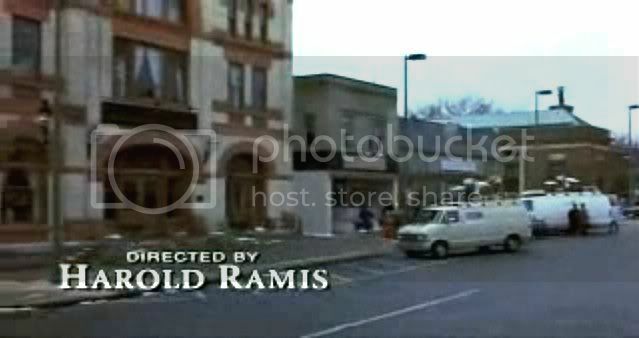 During filming, merchants gave out Groundhog Bucks, which could be redeemed in local stores for merchandise. There were plenty of souvenirs to buy, too. T-shirts, sweatshirts, hats, buttons and pins were available, all adorned with a cute groundhog cartoon. Of course, local people were extras in the movie. 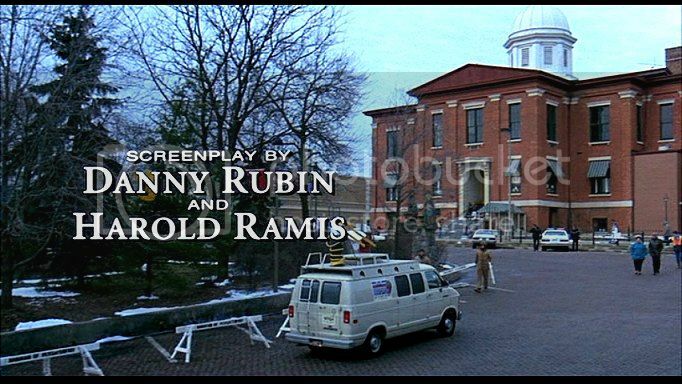 Before filming started, Columbia Pictures held a "cattle call" for extras at the Woodstock High School. I briefly considered attending, but when I saw the line of people stretch all the way down the street, I quickly changed my mind! Since the entire town square was a movie set, there were lots of things that we got accustomed to seeing every day. You don't realize how much goes into the making of a movie until you actually see it firsthand. 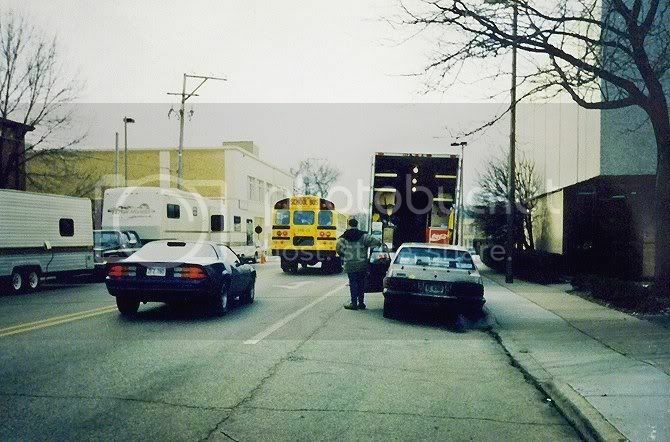 The streets surrounding the square were full of trailers and trucks. Large electric cables were everywhere, strewn on the ground and dangling from rooftops. Crew members drove around in little green John Deere vehicles. 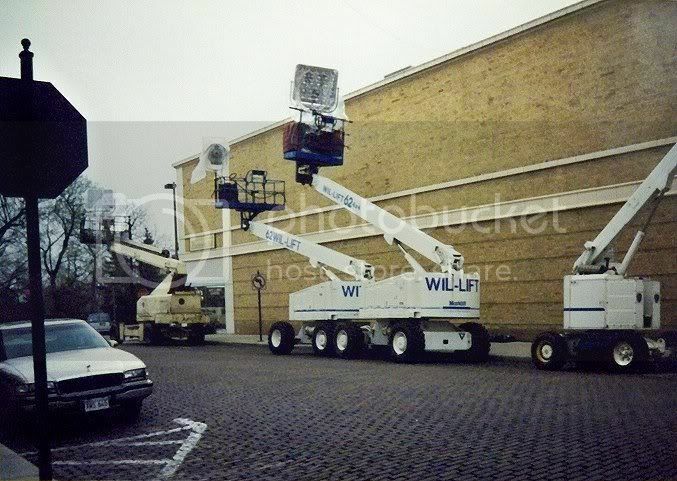 Versatile "lifts" were used for all sorts of things, from hanging banners and positioning lights on rooftops to aiming lights in second-floor windows for indoor filming. 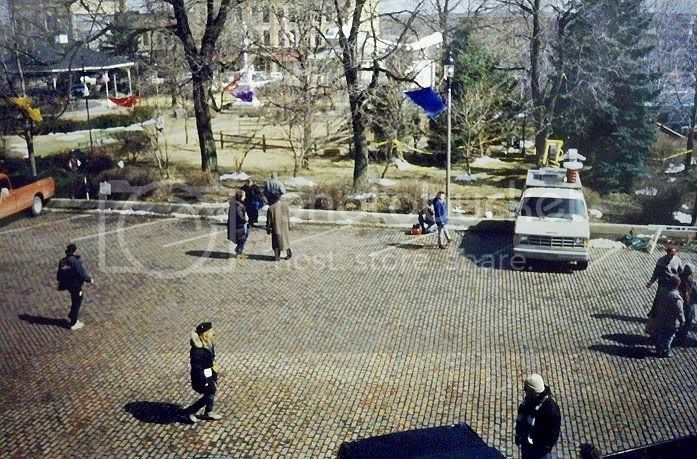 Filming took place between March and June of 1992. There was some real snow during the early weeks. 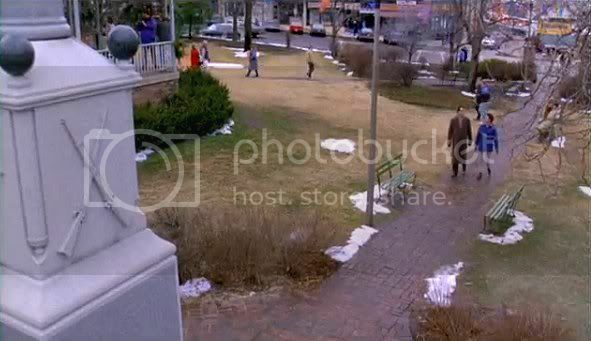 According to the DVD commentary by Harold Ramis, a good deal of the falling snow during the romantic scenes in the square was real. 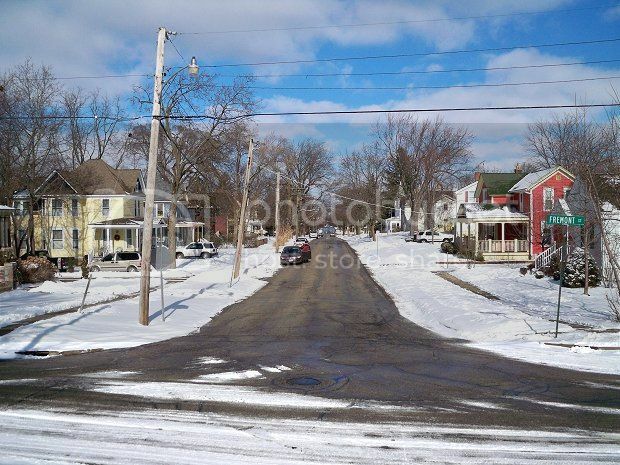 The snow covering the street in the very last scene was also real. 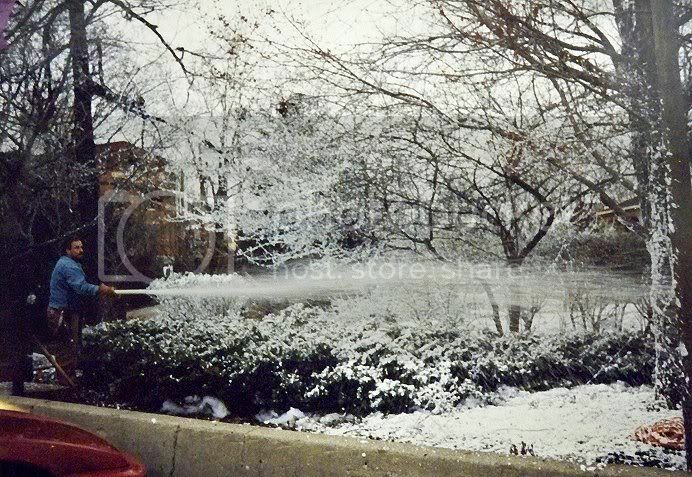 However, much of the snow you see in the movie is fake. 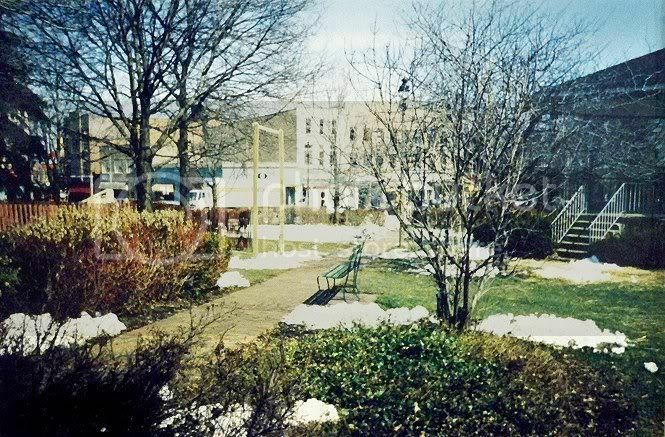 Three types of fake snow were used: foamy shaving cream snow, man-made snow (like on a ski slope) and cotton snow sewed into the ground. 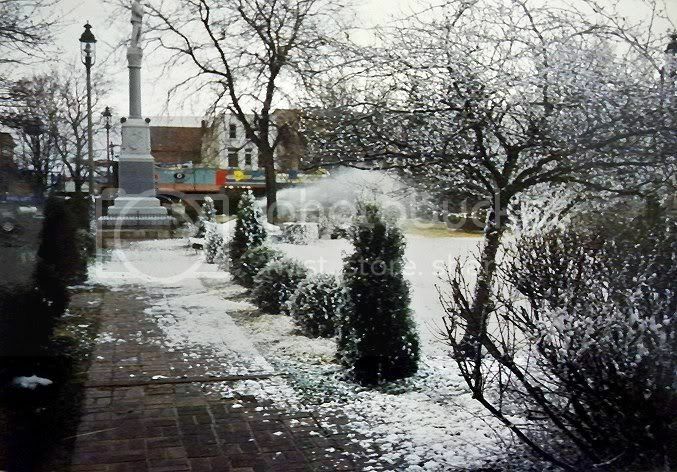 The man-made snow was used during the night scenes in the square, where Phil (Bill Murray) and Rita (Andie MacDowell) build a snowman, carve an ice sculpture and dance in the gazebo. 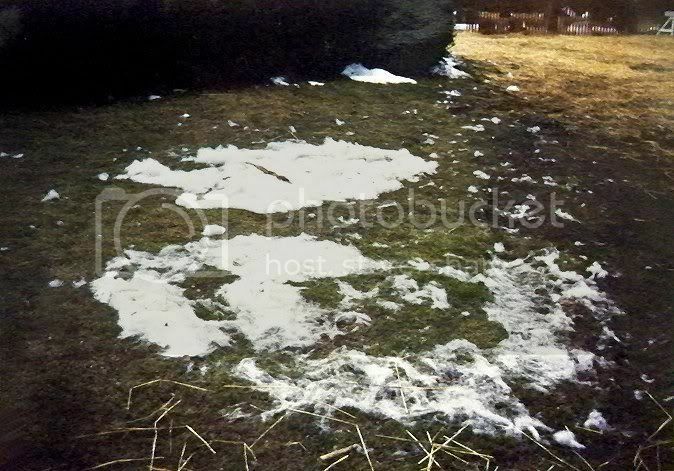 For the other scenes, you see mostly cotton snow and foamy snow. 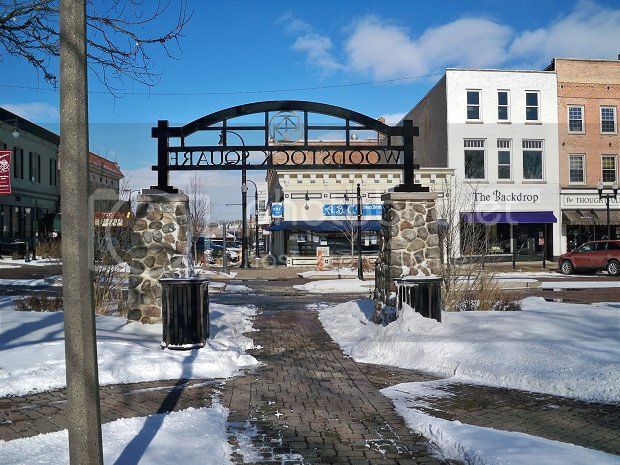 The foamy snow was sprayed on the sidewalks and steps around the square, where it hardened in the cracks and crevices and kept the square looking wintery well into early summer. We got quite used to seeing it all over the place. 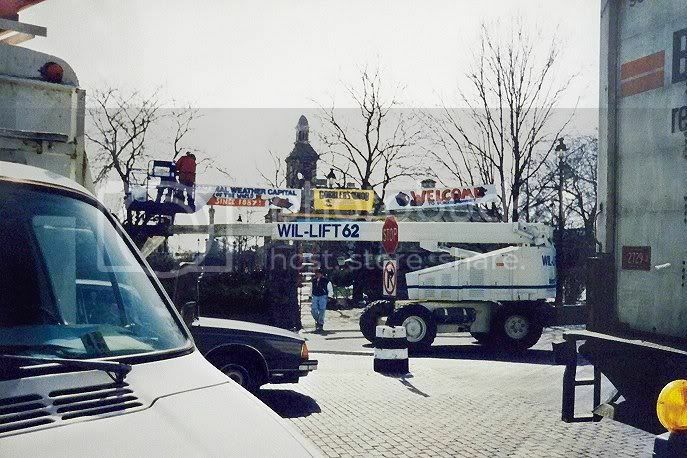 Being on the square every day, I saw a great deal of filming. 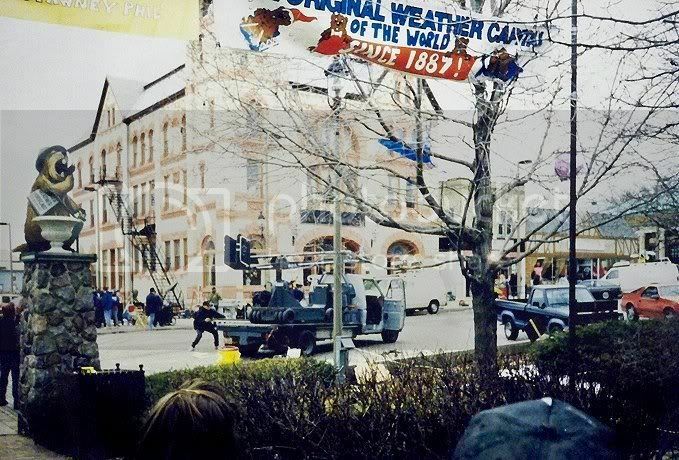 The public was invited to watch all outdoor filming. 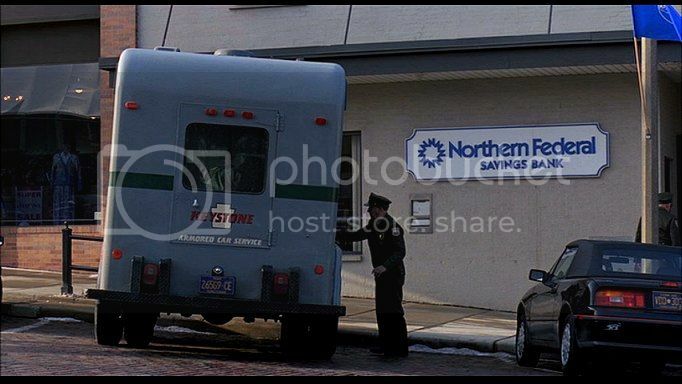 All they had to do was be quiet, stay behind the barricades and not use any flash photography. Everyone was very cooperative....seeing the movie now, you'd never know that large crowds of people were standing just beyond the camera's reach. 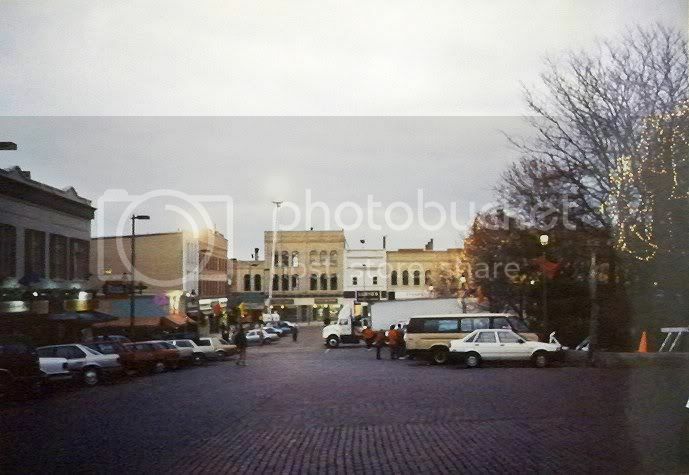 The early-morning scenes inside the square (where everyone is dancing to the "Pennsylvania Polka") were filmed in the late afternoon and were pretty much open to anyone who happened by. Security made no attempt to keep people out. I was just leaving work, so naturally I "happened by!" Large white screens reflected the sunlight and water trucks sprayed water on the square to make the streets look cold and icy. 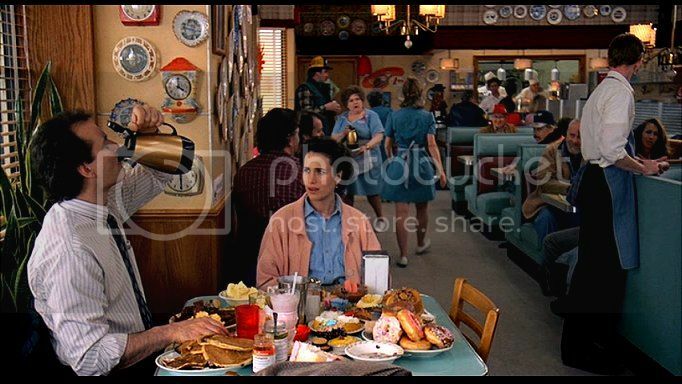 Filming began in March 1992 and stretched into June in some places, although it was supposed to be February 2nd in the movie. "Although the extra parts are all taken and meeting the stars depends on luck and timing, Jean Marie Saidler (Assistant Location Manager) can make a few guarantees for those watching the movie making. 'Before they leave Woodstock they'll have a full command of the language,' Saidler said." And she was right! 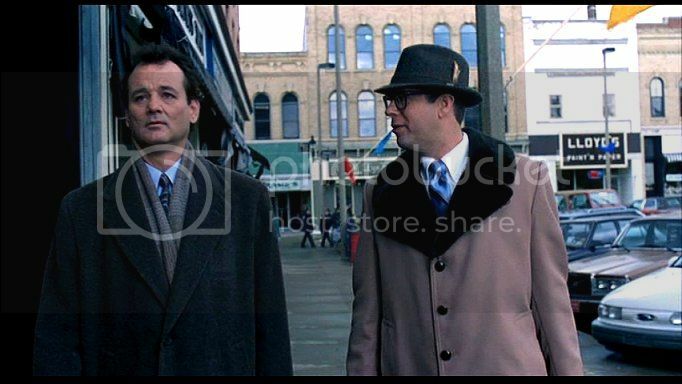 In the movie, Phil Connors (Bill Murray) relives the same day over and over again. In the DVD commentary, director Harold Ramis estimates that Phil spends ten years in the time loop; he later said this figure was too low. Bill Murray's character stays at the Cherry Street Inn, which in real life is a beautiful large house at the intersection of Madison and Fremont Streets. 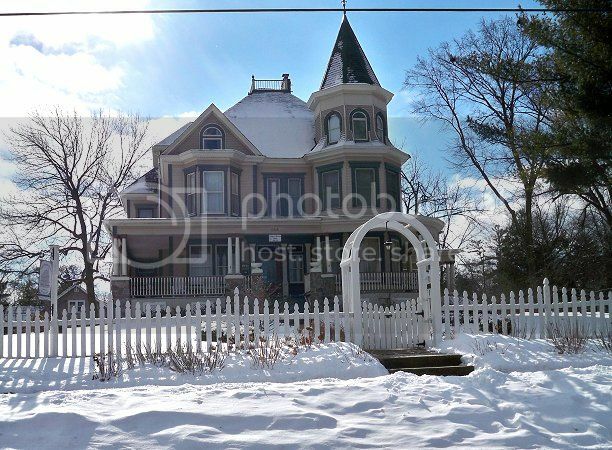 Previously a private home, it opened in 2010 as a bed & breakfast known as the Royal Victorian Manor. We just call it the "Groundhog Day house." In the movie, every morning begins the same way....the clock flips over to 6:00, "I Got You Babe" starts playing on the radio, and Phil hops out of bed to look out the window. 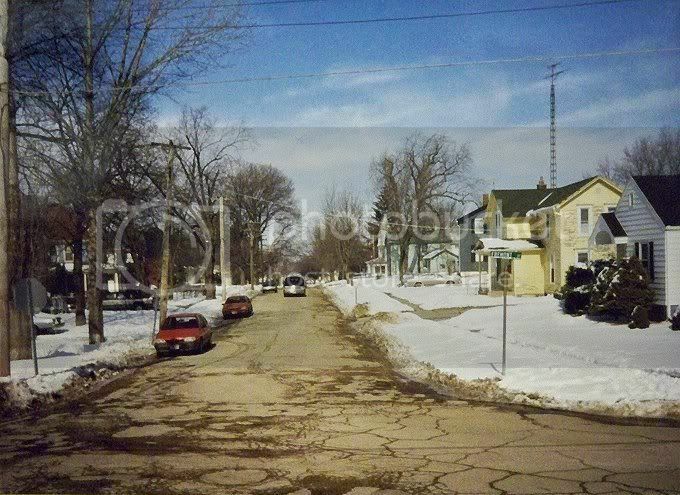 He sees the real Madison Street, which is also where the "piano teacher's house" is located. 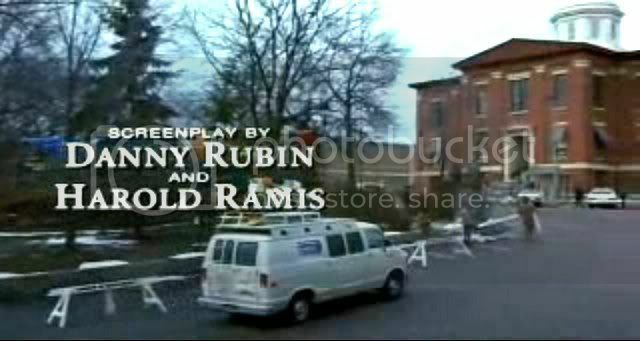 The indoor scenes at the Cherry Street Inn were filmed on a specially-constructed set in a warehouse in Cary, Illinois. 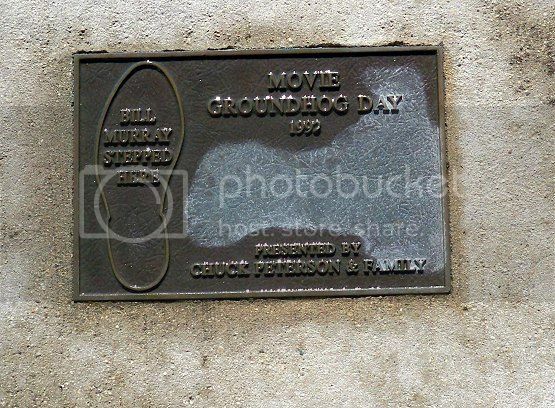 Groundhog Day opened in February 1993. 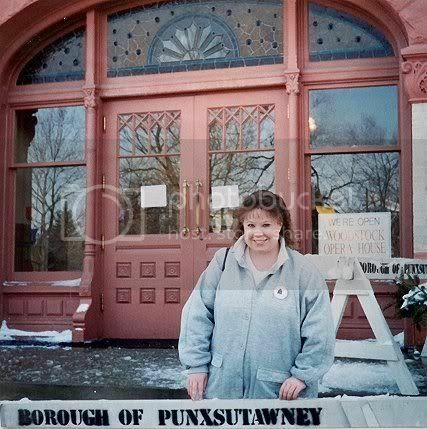 Although the real Punxsutawney wasn't used in the film, Columbia felt it was only fair to hold the first preview there....fittingly, on Groundhog Day. 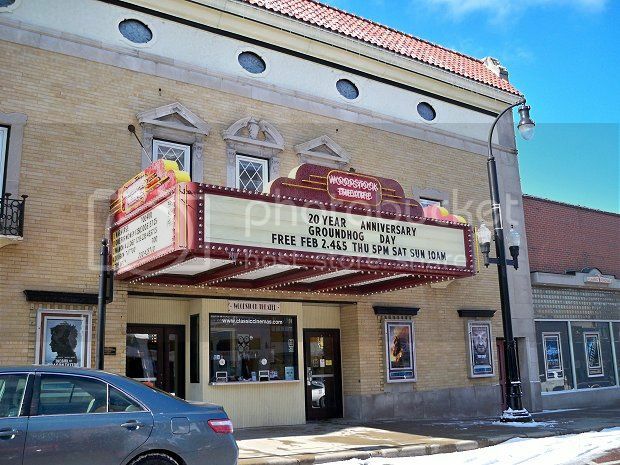 Here in Illinois, the nearby town of Crystal Lake hosted a second preview on February 5th at the Showplace Theater on Williams Street (now the Raue Center). 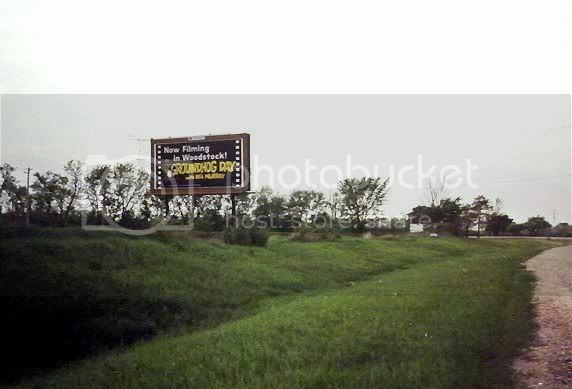 It opened nationwide to excellent reviews on February 12, 1993. 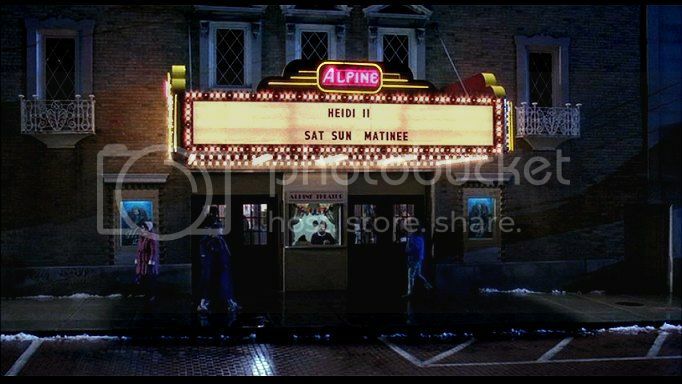 I didn't attend the preview, but I did see the movie in Crystal Lake just a short time later. The theater was completely packed! I had seen many movies there, but this was the first time that I could recall seeing the balcony occupied. As each familiar sight flashed on the screen, it was met with cheers and applause. 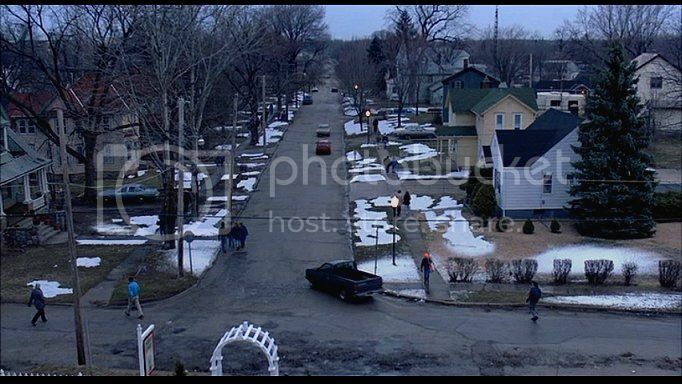 When you think about it, how many people get to see their town portrayed so extensively on the big screen? What made it even better was the fact that the movie itself was absolutely excellent. This was the icing on the cake. 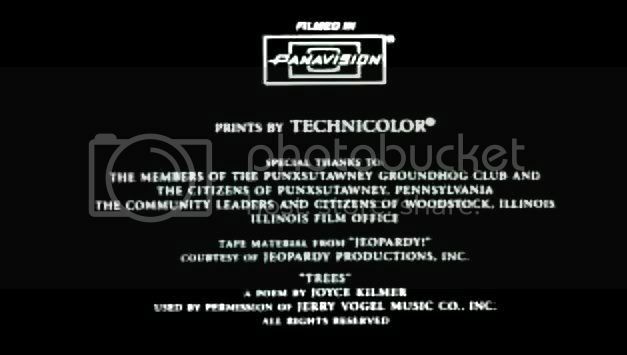 Woodstock reaped the benefits of Groundhog Day long after the film crews departed. 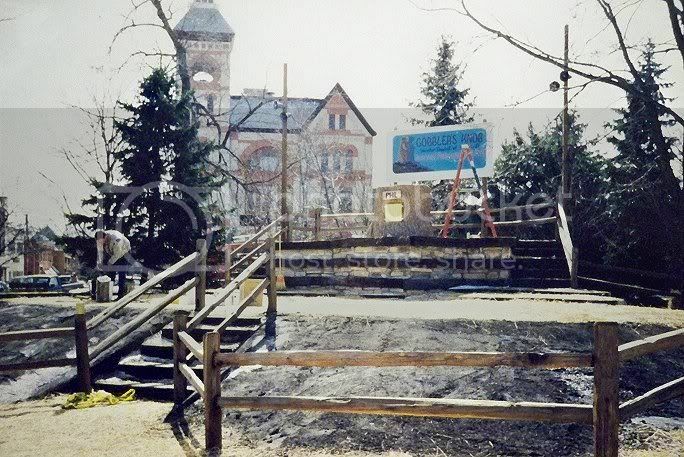 After Gobblers Knob was dismantled, Columbia Pictures paid for new shubbery and repaving of the cobblestone walkways in the square. 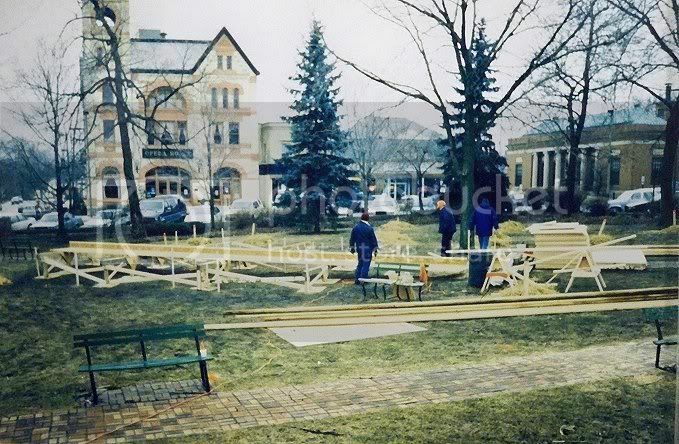 Each year, Woodstock celebrates the real Groundhog Day with several days of activities, including a chili cook-off, a walking tour of film locations (all of which are plaqued), free showings of the movie, a dance, and a weather prognostication from our own resident rodent, Woodstock Willie. 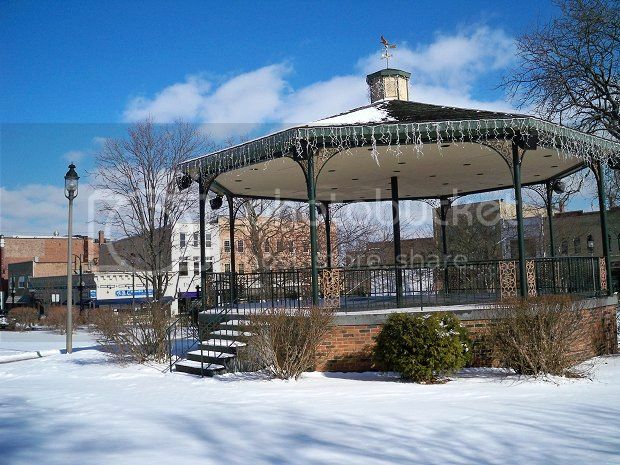 In February 2012, I paid a visit to the Woodstock Square to photograph several Groundhog Day filming locations. 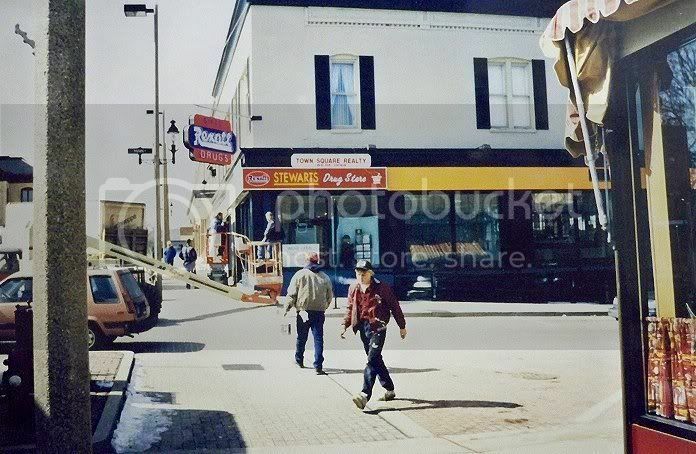 Woodstock was getting ready to celebrate the 20th anniversary of the filming of the movie, and I wanted to document how the area had changed in 20 years. 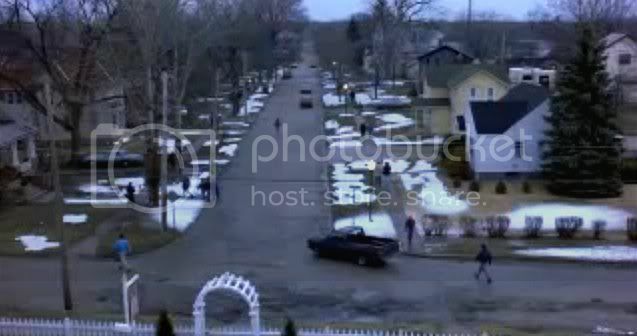 To the right, you can see some screenshots from the movie, accompanied by a photograph showing how the same spot looked in 2012.